Rare bird in military colours these days is the air/sea rescue version of the Boeing Flying Fortress. The ex-U.S.A.F. Boeing SB-17G wears Portuguese Air Force markings and is currently based at Lagens AFB, in the Azores. It keeps company with a Portuguese Air Force Grumman SA-16A Albatross amphibian. A Boeing KB-29P (Sculthorpe AFB.) 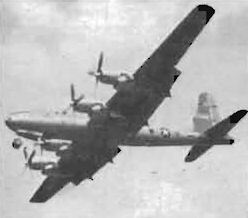 of 520th Flight Refuelling Squadron, now re-equipping with KB-50Ds. 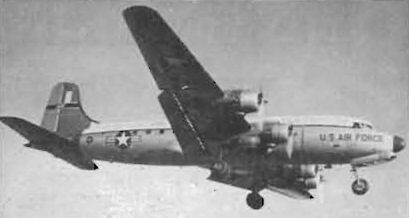 A Keflavik-based C-54 of MATS's Icelandic Air Defence Fore;. Also seen at Bankstown was this R.A.F. 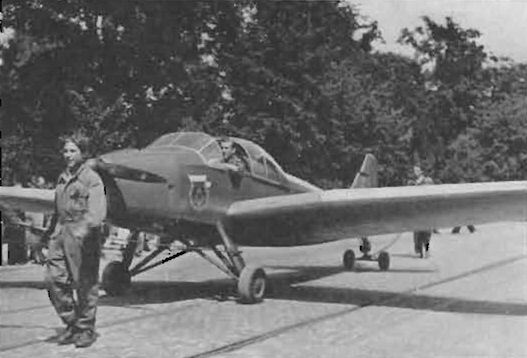 Meteor (VW266), an F Mk. 4 converted by Fairey Aviation Company of Australasia Pty. to U. Mk. 15 standard for remote-control (pilotless) operations at Woomera. Note wingtip camera nacelle. 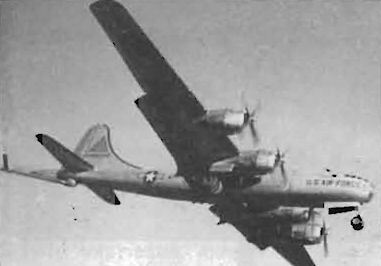 A WB-50D (Burtonwood AFB.) of 53rd Weather Recce. Squadron. SHUTTERBUG LINCOLN. A familiar resident of Blackbushe Airport is the Ministry of Supply's camouflaged Avro Type 694 Lincoln B. Mk. 2 (serial RF332) which, for a brief period recently (for a film), carried the unique "squadron letters" EAS, in red, of the civilian contractor Eagle Air Services Ltd. Note also the Eagle Air Services' badge on the nose. This Lincoln is used by the M.o.S. to obtain air-to-air photos for aircraft recognition purposes. Still going strong is Derby Aviation's Avro Anson I with an EM "bird" under the fuselage for mineral surveying. "HEAP BIG SMOKE". A smartly-painted, pre-war Lockheed Model 10E Electra photographed recently at San Fernando, California by Warren M. Bodie of Van Nuys. The 550-h.p. P. & W Wasp S3H1 radials are enclosed in military-surplus BT-13 cowlings. The Electra can seat twelve and has a max. speed in excess of 210 m.p.h. Note the Red Indian "fire-maker" insigne on the fin and rudder. Another EM "bird'' carrier is the Kenting Aviation's Lockheed Model 14-08 (c/n. 1500; CF-TCO) ex-TCA. A gaudily-painted, single seat conversion by Gene Sherry of Waukesha, Wisconsin of a Ryan ST-3KR two-seat primary (N60155 Exp'l) with a 220-h.p. Continental R-670-4 replacing the standard 160-h.p. Kinner R-540-1 radial. Newly-painted is a rebuilt Waco ZQC-6 (c/n. 4643; CF-BDW) at Hamilton. Apart from the well-known SAAB 91C Safir G-ANOK, based at Luton, there is a second Swedish-designed Safir in the U.K. This is a 91A Safir (serial 91118), based at Hatfield and belonging to the Swedish Air Attache. Power, 145-h.p. DH Gipsy Major 19. Parading a L.W.D. 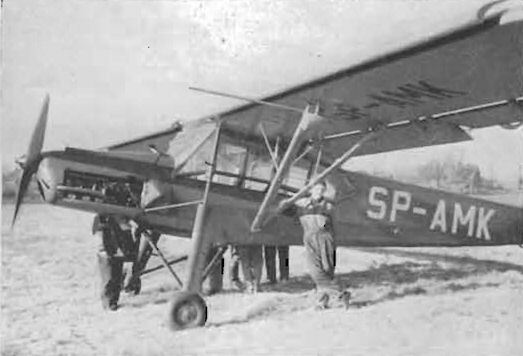 Zak-3 side-by-side primary trainer of Z.P.M. during a youth festival in Warsaw. Z.P.M. means Zwiazek Mlodziezy Polskiej or Polish Youth Organisation. Perhaps not unique but certainly different are the markings of this Fighter Command, R.A.F. Gloster Meteor F. Mk. 8 (WF677). The black-painted fin carries the initials of the Wing Commander (Flying), Church Fenton, Yorkshire, W/Cdr. Maurice Shaw, l/c. 72 Squadron (blue with red outlines) and 19 Squadron (white and blue chequers).